Honda Malaysia (HM) had its annual media gathering yesterday where the company announced its sales performance for last year and its targets for this year. 2018 was a rollercoaster year for the auto industry, thanks to a surprise three-month tax holiday, but Honda ended up in its now customary position as the top non-national marque (four consecutive years now) and number two in the overall standings (three years running) behind Perodua. En route, the company sold 102,282 units in 2018, which is 6.6% lower than in 2017 and short of its 109,000 sales target for the year. The marque’s 2018 market share was 17.1%, slightly short of the 18% target. However, Honda managed to surpass the 100k units mark, which was first breached in 2017. All HM’s locally assembled models ended the year as segment leaders, and the City B-segment sedan contributed 32% to the final tally, followed by the Civic (16%) and CR-V (13%). Over the past few years, HM has been introducing its three pillars of technology: Honda Sensing, VTEC Turbo and Sport Hybrid i-DCD. Acceptance of these have been growing; the company says that the Accord with Honda Sensing contributed to 18% of model sales (of over 3,600 units) in 2017-2018, and the figure goes up to 33% of the 20,600 CR-Vs sold during the period. As for turbo, Honda was the first Japanese carmaker to introduce a downsized turbo engine in the mass market C-segment with the Civic FC in 2016. The company has shifted over 41,000 units of the segment leader since, and of the total, 58% have the 1.5 litre VTEC Turbo engine, which is also available in the CR-V. 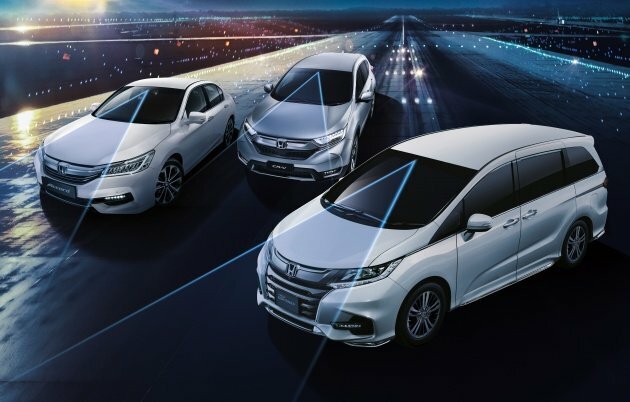 The company says that its Sport Hybrid i-DCD-equipped models (City and Jazz) “also received good acceptance from the market.” Last year, HM launched the Honda Odyssey facelift, a premium CBU imported MPV with Honda Sensing as standard. On the after-sales front, HM saw 11% growth in service intake last year over 2017. It’s the highest ever level for the company, complemented by another record in the sales of Honda Genuine Parts, which saw a jump of 25%. Looking ahead, HM anticipates a 2019 total industry volume (TIV) of 580,000 units; based on that, it’s targeting sales of 95,000 units with target market share of 16%. A challenging market is the reason for the lower projections. The company has outlined three key strategies for continued growth, and they are the improvement of customer service standards, the strengthening of its dealership network and the introduction of new models. Unlike the media gatherings of previous years, HM did not release any news/teaser of upcoming new models yesterday. The post Honda Malaysia sold 102k units in 2018; maintained non-national lead, overall No.2 – 95k target for 2019 appeared first on Paul Tan's Automotive News. 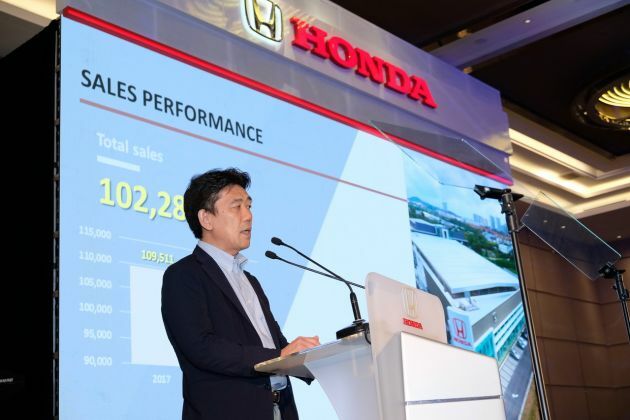 0 Response to "Honda Malaysia sold 102k units in 2018; maintained non-national lead, overall No.2 – 95k target for 2019"